Holy cow, look at that! You want an explanation of what you're looking at? You know the drill: sit back, relax, and have a listen. Regular readers may remember a flurry of entries here about the Spitzer Space Telescope, an orbiting observatory that can detect infrared light. IR, as it's called, tends to be given off by warm dust in space (by warm I mean astronomically warm: maybe from Antarctic temperatures to room temperature or so). You can do some observations of IR from the ground, but our air has this annoying tendency to absorb light at these wavelengths, so in effect we're blind down here to astronomical IR (though we can breathe, so there are advantages to air as well). 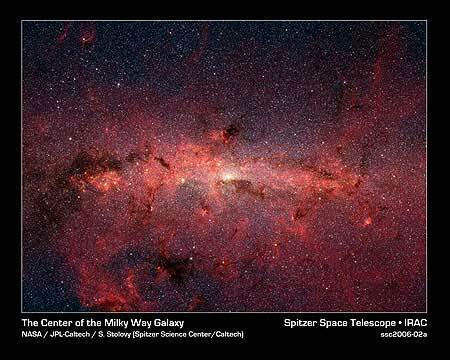 That's why Spitzer is in orbit. Though it's not a particularly large telescope (its mirror is less than a meter across, smaller than most ground-based professional 'scopes), its vantage point over our atmosphere gives it remarkable views of space. Like that picture at the top of this entry. What you're seeing there (click for access to much higher-res images) is the inner 900 x 600 light years of our Galaxy, the Milky Way. For comparison, the Earth is roughly 25,000 light years from the center, and the whole Galaxy is 100,000 light years across. So this image represents the inner 1% of the whole shebang. The wealth of science in this image is astounding. It's a composite of three IR "colors", each of which is sensitive to different processes. The flavor of IR nearest to visible light is emitted by both dust and stars. But as you go farther into the IR, the stars disappear and the dust really gets bright. By adding together these colors, a rich tapestry is created. Nearly all the stars in this image are red giants and red supergiants, stars in their declining years (where the Sun will be in a few billion years). Some will simply fade away, while others will explode as supernovae. When they do, they create so much energy it can blow gas clear out the Galaxy. Super-bright stars also blow off winds of gas that can slam into the junk (more gas and dust) between the stars, driving it out of the Galaxy the same way a snowplow pushes snow off your driveway. The tendrils of dust above and below the Galactic center display this silent wind. 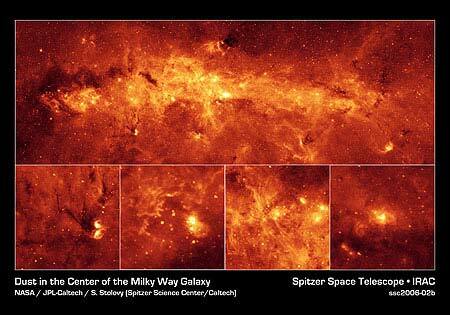 In the center, the Milky Way is glowing brightly in IR. In the middle of that spot, far too small to see on this scale, is a black hole 4 million times the mass of the Sun. It's too far away from us to hurt us, but it strongly affects the objects within a few hundred light years of its terrible grip. Gas, dust, and stars are streaming around it at speeds of hundreds of kilometers per second, heating up the surrounding neighborhood, causing it to glow in IR. 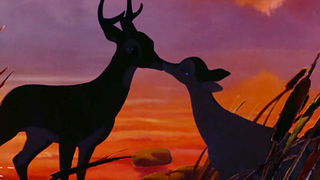 Much higher-resolution images show some of this better. Sometimes, as material gets very near the black hole, it heats up as it falls in. The material releases this energy, sparking flares of emission we can detect even from our relatively safe vantage point of 250 quadrillion kilometers away. To understand this better, astronomers started a multi-telescope campaign to observe the black hole, which included Spitzer (IR), Hubble (visible light), XMM-Newton (high-energy X-rays), INTEGRAL (super high-energy gamma rays) and many ground-based 'scopes. By observing at all these different energies, astronomers can figure out quite a bit about the physical mechanisms going on. The big mystery is not that the stuff near the black hole there is glowing, but why it's not glowing very much. Some galaxies boom out from their cores (we call them active galaxies), but ours doesn't. I suppose that's a good thing, as this tends to make the galaxy a bit inhospitable for folks like us.